We have noted in the previous chapter how the governing class of Great Britain steadily acquired the land and destroyed the liberty of the common people throughout the eighteenth century, and how greedily and blindly the new industrial revolution was brought about. We have noted also how the British Parliament, through the decay of the representative methods of the House of Commons, had become both in its upper and lower houses merely the instrument of government through the big landowners. Both these big property-holders and the crown were deeply interested in America; the former as private adventurers, the latter partly as representing the speculative exploitations of the Stuart kings, and partly as representing the state in search of funds for the expenses of foreign policy, and neither lords nor crown were disposed to regard the traders, planters, and common people of the colonies with any more consideration than they did the yeomen and small cultivators at home. At bottom the interests of the common man in Great Britain, Ireland, and America were the same. Each was being squeezed by the same system. But while in Britain oppressor and oppressed were closely tangled up in one intimate social system, in America the crown and the exploiter were far away, and men could get together and develop a sense of community against their common enemy. Moreover, the American colonist had the important advantage of possessing a separate and legal organ of resistance to the British government in the assembly or legislature of his colony that was necessary for the management of local affairs. The common man in Britain, cheated out of his proper representation in the Commons, had no organ, no centre of expression and action for his discontents. «God made all men naturally equal. «Ideas of earthly superiority are educational, not innate. «Kings were made for the good of the people, and not the people for them. «No government has a right to make slaves of its subjects. «Though most governments are de facto arbitrary, and consequently the curse and scandal of human nature, yet none are de jure arbitrary». Some of which propositions reach far. This ferment in the political ideas of the Americans was started by English leaven. One very i nfluential English writer was John Locke (1632-1704), whose Two Treatises on Civil Government may be taken, as much as any one single book can be taken in such cases, as the point of departure for modern democratic ideas. He was the son of a Cromwellian soldier, he was educated at Christ Church, Oxford, during the republican ascendancy, he spent some years in Holland in exile, and his writings form a bridge between the bold political thinking of those earlier republican days and the revolutionary movement both in America and France. But men do not begin to act upon theories. It is always some real danger, some practical necessity, that produces action; and it is only after action has destroyed old relationships and produced a new and perplexing state of affairs that theory comes to its own. Then it is that theory is put to the test. The discord in interests and ideas between the colonists was brought to a fighting issue by the obstinate resolve of the British Parliament after the peace of 1763 to impose taxation upon the American colonies. Britain was at peace and flushed with successes; it seemed an admirable opportunity for settling accounts -with these recalcitrant settlers. But the great British property owners, found a power beside their own, of much the same mind with them, but a little divergent in its ends-the reviving crown. King George III, who had begun his reign in 1760, was resolved to be much more of a king than his two German predecessors. He could speak English; he claimed to «glory in the name of Briton»-and indeed it is not a bad name for a man without a perceptible drop of English, Welsh, or Scotch blood in his veins. In the American colonies and the overseas possessions generally, with their indefinite charters or no charters at all, it seemed to him that the crown might claim authority and obtain resources and powers absolutely denied to it by the strong and jealous aristocracy in Britain. This inclined many of the Whig noblemen to a sympathy with the colonists that they might not otherwise have shown. They had no objection to the exploitation of the colonies in the interests of British «private enterprise», but they had very strong objections to the strengthening of the crown by that exploitation so as to make it presently independent of themselves. The war that broke out was therefore in reality not a war between Britain and the colonists, it was a war between the, British government and the colonists, with a body of Whig noblemen and a considerable amount of public feeling in England on the side of the latter. An early move after 1763 was an attempt to raise revenue for Britain in the colonies by requiring that newspapers and documents of various sorts should be stamped. This was stiffly resisted, the British crown was, intimidated, and the Stamp Acts-were repealed (1766). Their repeal was greeted by riotous rejoicings in London, more hearty even than those in the colonies. But the Stamp Act affair was only one eddy in a turbulent stream flowing towards civil war. Upon a score of pretexts, and up and down the coast, the representatives of the British government were busy asserting their authority and making British government intolerable. The quartering of soldiers upon the colonists was a great nuisance. Rhode Island was particularly active in defying the trade restrictions; the Rhode Islanders were «free traders»,-that is to say, smugglers; a government schooner, the Gaspee, ran aground off Providence; she was surprised, boarded, and captured by armed men in boats, and burnt. In 1773, with a total disregard of the existing colonial tea trade, special advantages for the importation of tea into America were given by the British Parliament to the East India Company. It was resolved by, the colonists to refuse and boycott this tea. When the tea importers at Boston showed themselves resolute to land their cargoes, a band of men disguised as Indians, in the presence of a great crowd of people, boarded the three tea ships and threw the tea overboard (December 16th, 1773). All 1774 was occupied in the gathering up of resources on either side for the coming conflict. It was decided by the British Parliament in the spring of 1774 to punish Boston by closing her port. Her trade was to be destroyed unless she accepted that tea. It was a quite typical instance of that silly «firmness» which shatters empires. 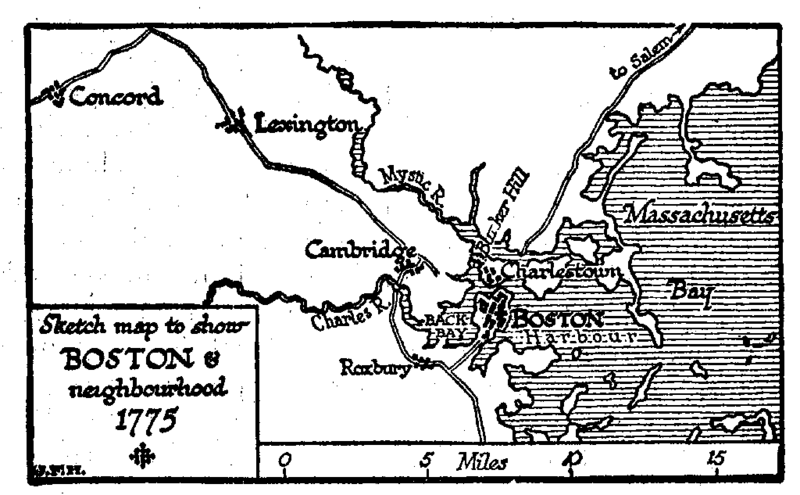 In order to enforce this measure, British troops were concentrated at Boston under General Gage. The colonists took counter-measures. The first colonial Congress met at Philadelphia in September, at which twelve colonies were represented: Massachusetts, Connecticut, New Hampshire, Rhode Island, New York, Now Jersey, Pennsylvania, Maryland, Delaware, Virginia, and North and South Carolina. Georgia was not present. True to the best English traditions, the Congress documented its attitude by a «Declaration of Rights». Practically this Congress was an insurrectionary government, but no blow was struck until the spring of 1775. Then came the first shedding of blood. Two of the American leaders, Hancock and Samuel Adams, had been marked down by the British Government for arrest and trial for treason; they were known to be at Lexington, about eleven miles from Boston; and in the night of April 18th, 1775, Gage set his forces in motion for their arrest. That night was a momentous one in history. The movement of Gage’s troops had been observed, signal lanterns were shown from a church tower in Boston, and two men, Dawes and Paul Revere, stole away in boats across the Back Bay to take horse and warn the countryside. The British were also ferried over the water, and as they marched through the night towards Lexington, the firing of signal cannon and the ringing of church bells went before them. As they entered Lexington at dawn, they saw a little company of men drawn up in military fashion. It seems that the British fired first. There was a single shot and then a volley, and the little handful decamped, apparently without any answering shots, leaving eight dead and nine wounded upon the village green. The British then marched on to Concord, ten miles further, occupied the village, and stationed a party on the bridge at that place. The expedition had failed in its purpose of arresting Hancock and Adams, and the British commander seems to have been at a loss what to do next. Meanwhile the colonial levies were coming up from all directions, and presently the picket upon the bridge found itself subjected to an increasing fire from a gathering number of assailants firing from behind trees and fences. A retreat to Boston was decided upon. It was a disastrous retreat. The country had risen behind the British; all the morning the colonials had been gathering. Both sides of the road were now swarming with sharpshooters firing from behind rock and fence and building; the soldiers were in conspicuous scarlet uniforms, with yellow facings and white gaiters and cravats; this must have stood out very vividly against the cold sharp colours of the late New England spring; the day was bright, hot, and dusty, and they were already exhausted by a night march. Every few yards a man fell, wounded or killed. The rest tramped on, or halted to fire an ineffectual volley. No counter-attack was possible. Their assailants lurked everywhere. At Lexington there were British reinforcements and, two guns, and after a brief rest the retreat was resumed in better order. But the sharpshooting and pursuit was pressed to the river, and after the British had crossed back into Boston, the colonial levies took up their quarters in Cambridge and prepared to blockade the city.